Those 40 fired DES employees who are being hired back? Fired DES Director Tim Jeffries responds to the rehiring, explaining that they WERE fired for legitimate reasons. This is unfortunate for the good employees who now have to work with them again, and the poor will have to deal with them. As soon as I get ahold of their names I intend to expose as much as possible. 1) At DES, we reduced the size of the workforce by 2% (approx. 7,700 to 7,500) in line with the Governor Ducey’s initiative to reduce the overall size of government. 2) At DES, 475 employees (approx. 6%) were exited in line with Governor Ducey’s third expectation in his “8 Leadership Traits” memo to “weed out” the worst 10%. 3) The overall demographics of the 475 DES employees that were exited were in line with the overall demographic percentages of DES. Only poor performers and bad actors were targeted. 4) Per 2012 Personnel Reform, no reason is required for the release of an AT WILL employee yet legitimate reasons were still necessary for terminations during my directorship. 5) Every former AT WILL employee who was exited had the individual option to file legal action as the individual deemed appropriate. 6) Only one former AT WILL employee filed a legal claim, and she eventually withdrew her suit. 7) When I commenced my directorship approx. 1,800 employees were COVERED employees; when I concluded my work approx. 350 employees were covered employees. 8) My recollection is that during my directorship approx. 25 covered folks retired, and approx. 25 covered employees were exited. 9) Every COVERED employee who was exited had the individual option to file a grievance with the State Personnel Board. 10a) Only two former COVERED employees filed a termination grievance with the State Personnel Board, and the two DES actions were sustained. 10b) I heard one of the terminated covered employees was rehired which means ADOA overruled the State Personnel Board’s prior ruling sustaining the termination. 11) Overall, approx. former 1,400 covered folks continue to work at DES, and are eligible for annual merit payments (which is awesome for them and their families). I sure hope that this ex-employee (aka BULLY) is not rehired!! Subject: RE: Loved my job. . . .now don’t know what I am going to do. . .
• Concerns regarding (the ex-employee in question) interaction with colleagues was being discussed with her by her office manager. During the meeting (The ex-employee in question) stated she ‘Feels like everyone else here is just waiting time, are snot-nosed kids’, while pumping her fists in the air in anger. Her violations of the TRIAD and lack of remorse, as well as performance issues and resistance to coaching toward improvement were of great concern and led to her exit. Please let me know if you would like any additional information or details. Arizona Republican Governor Doug Ducey fired his top reformer last month, Tim Jeffries, who he’d recruited to head the Department of Economic Security in February of 2015. Jeffries came in and cleaned up the agency, firing corrupt employees and improving morale, but once those terminated workers complained to the left-leaning Arizona Republic, the paper went all out to take him down with baseless smears, and the governor eventually deserted him. With a background in the private sector, Jeffries went about reforming government at the “speed of business.” When Ducey took office almost two years ago, he instructed state agency directors to reduce their agencies by 2 percent. Jeffries is probably the only agency director who accomplished that goal, terminating 475 employees and eliminating some of those positions. Prior to Jeffries’ arrival, DES had become a bloated agency, the second largest in the state with over 7,000 employees and several hundred temporary workers and high-priced contractors. Jeffries had the Arizona Attorney General’s Office bring charges against a corrupt state legislator who fraudulently obtained $1,726 in food stamps. Democratic Rep. Ceci Velasquez “falsely claimed she had two dependents, gave a false address and allowed two other people to use her food stamp benefit card.” A grand jury indicted her on three felonies for welfare fraud. The investigation had started under Jeffries’ predecessor, but went nowhere since he was afraid to touch it. 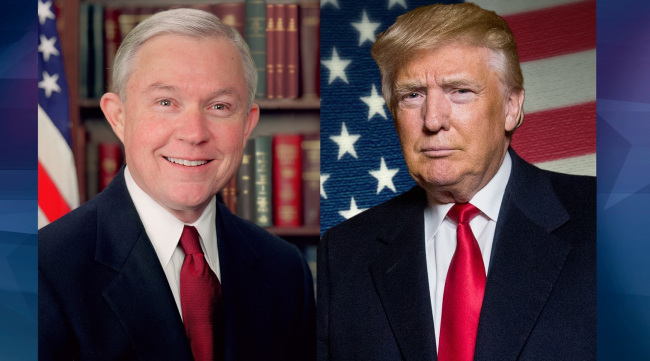 Why are elected officials above the law? No Arizona public official had ever been investigated and prosecuted for food stamp fraud prior to Jeffries’ directorship. The AG’s office eventually caved, letting her plea to a mere misdemeanor charge and probation. Velasquez plans to run again for the Arizona House in 2018 after her lone misdemeanor clears. Once the media decides it doesn’t like you, it throws a bunch of accusations together with the words “controversial” and “scandal.” Craig Harris, a reporter with the Republic, is known for putting together sloppy paragraphs with a flashy headline, repeating the same baseless claims over and over throughout multiple articles. Additionally, the Republic suffers from a failure to separate between news and opinion articles. Republic opinion writer Laurie Roberts, also known for her hit pieces on conservatives, tag teamed with Harris against Jeffries. She became increasingly hyperbolic with her histrionics, titling one column “Booze Before Blood.” It was a cruel jab at Jeffries, because she knew fully well that one of the men who killed his brother drank alcohol before killing him. The paper piled on Jeffries and his revamped management team for firing 475 employees, accusing him of terminating employees who didn’t deserve to be fired. Yet none of this reporting addressed the specific reasons the former employees were terminated, including the fact most of the employees were at-will employees and only one of them had sued the agency over it. The Republic and other newspapers could not stand Jeffries blunt-spoken style; Jeffries did not hesitate to call some of the fired employees “bullies, liars, racists, sexual harassers, and multi-year bad actors.” Instead, the biased articles discussed how many of the employees were women, seniors, and minorities even though the percentages released were in line with DES employee statistics. The Republic is now sympathetically covering the attempts of the terminated employees to regain their jobs. The Republic extensively covered a series of allegations against Jeffries, but virtually all of them are false. He was accused of compiling a “do-not-hire” list of fired DES employees — but it was really another agency which created the list, the Department of Administration. Leah Landrum-Taylor, a former Democratic state legislator who worked for Jeffries and reportedly wanted his job, told the Republic that Jeffries bought alcohol for employees during work hours in Nogales, but it was a lie; Jeffries has a time-stamped photo of him with Landrum-Taylor in the Nogales DES office after the time she stated the party started. The restaurant visit took place for colleagues after their respective work hours. Every DES client was kindly served that day in Nogales and throughout Arizona. The paper also smeared him for using the “governor’s plane” for the trip, however the three state planes are owned by the Department of Public Safety, and the interagency agreement for DES to use air assets was in place prior to Jeffries’ arrival. Furthermore, other Arizona agency directors use the planes too. The Republic and other media sources have repeatedly featured DES employee Andy Hall, who Jeffries had terminated shortly after Hall criticized the DES press secretary for emailing employees about his latest disagreement with Jeffries. The Republic didn’t bother to report that “Hall is a know it all, never afraid to challenge, grate and insult people,” a source told me. Hall “sent two insulting emails to the DES press secretary” and ranted online frequently about DES and Jeffries. Regardless, as an at-will employee, no reason was required to fire him. Prior to Jeffries’ arrival, over 30 DES service centers had armed security guards to protect employees and clients. After the terrorist attack in San Bernardino took place at a social services center for people with developmental and intellectual disabilities, Jeffries directed his inspector general to transition the contract guard security force to a newly formed DES Protective Services. This group would continue the paramount mission to protect DES employees and clients. This group would also be better trained and more cost effective, thereby positioning DES to expand the number of service centers with armed protection. The Republic slammed him for implementing this common-sense measure, even though DPS guidelines were followed throughout and the effort to protect DES employees and clients was highly transparent. This is a classic example of how the left is able to take down the brightest, innovative conservatives; through smears, insinuations and outright lies. Since Jeffries’ departure, many of the significant projects have been halted. It is the poor, disabled and downtrodden who will suffer as government returns to moving at the speed of a glacier, fired “bullies and bad actors” return, and agency morale plummets. 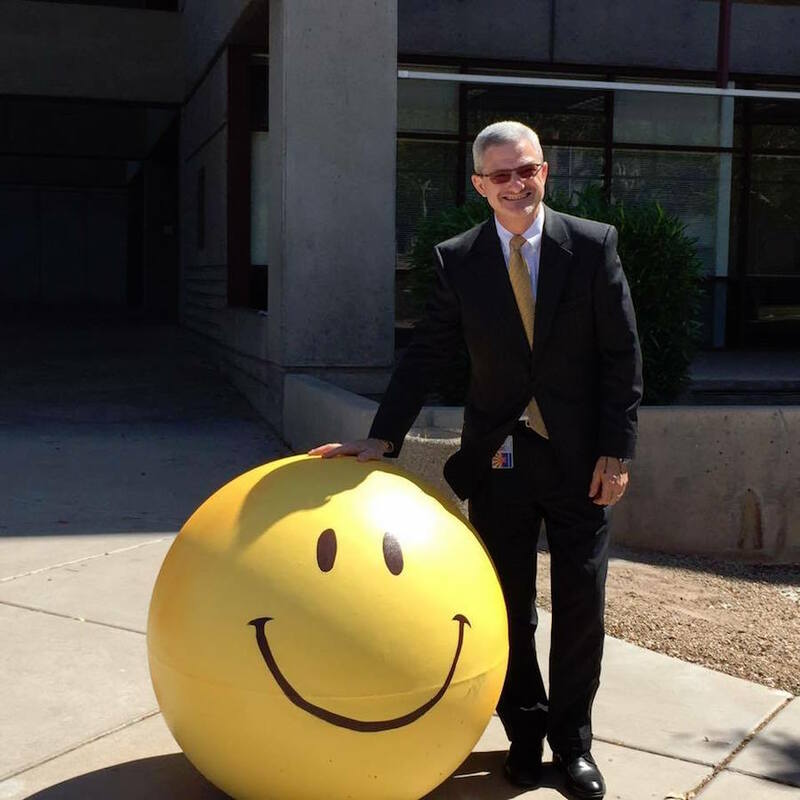 The bright shining moment for thousands of DES employees is dimming. If you put lipstick on the Common Core pig, it is still a pig! The Arizona Department of Education (ADE) and State Board of Education (SBE) are on the verge of rebranding the Common Core State Standards for the second time in three years. The latest 2016 draft of the English Language Arts (ELA) and Mathematics Standards shows very few changes. Jennifer Reynolds, publisher of Arizonans Against Common Core, circulated an urgent communication Wednesday urging the public to speak out against the proposed 2016 standards. The ADE Working Groups were tasked to review and incorporate our public comments which have been ignored. Our pleas to take out the “prescriptive examples and developmentally inappropriate standards for ELA and Mathematics” have been brushed aside, and the ADE Working Groups proceeded with the 2nd rewrite with very little changes to the Arizona’s College and Career Ready Standards (aka Common Core). If you put lipstick on the Common Core pig, it is still a pig! When Governor Jan Brewer (R) used an executive order to rebrand Common Core in 2013, there was less public awareness regarding the standards. The growing awareness among the public has not effected change. Parents and teachers have watched Arizona become one of the top five worst states for teachers and school-system quality. 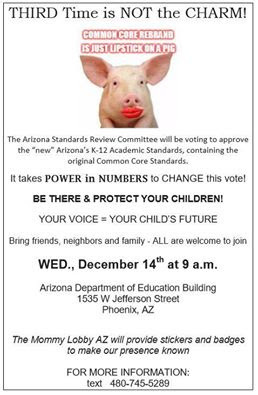 We need your voices at the Arizona Standards Development Committee Meeting on December 14th. December 14, 9am at the ADE building (1535 W. Jefferson, Phoenix, AZ 85007). If you have commented on the draft 2016 ELA and Math standards AND/OR if you are fed up with what is happening in your child’s classroom with the Common Core standards and testing please show up and let your voices be heard. Nothing will change in Arizona if the 2016 ELA and Mathematics standards are approved by the Arizona Standards Development Committee and the State Board of Education which will happen with a subsequent vote. Common Core will be here to stay if we don’t rise up and stop it! Can't attend the meeting? HERE is a list of who to contact. 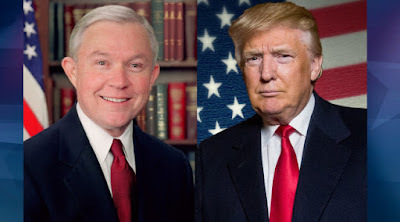 Once Alabama Sen. Jeff Sessions is confirmed as attorney general, he must work with Congress to clean up the corruption within the Department of Justice. One of the first cases he should review is the prosecution of former Arizona Congressman Rick Renzi. As a former assistant attorney general for the state of Arizona and a former prosecutor with the Maricopa County Attorney's Office, I have never seen a more egregious political prosecution as well as corrupt electioneering by a foreign interest than the DOJ’s crusade against Renzi. Some may remember that Renzi was convicted in a split verdict on some corruption counts involving two proposed federal land exchanges. What has been found since casts grave doubt on the legitimacy of the investigation, prosecution, and conviction.